The United Nations human rights office says it is ‘deeply disturbed’ by death sentences handed down by a Libyan court to a son of Colonel Gaddafi and eight officials from the deposed dictator’s regime. Saif-al Islam Gaddafi had given evidence to the hearing by video link and was not in the courtroom in Tripoli to hear the verdict. Since 2011, the late leader’s son has been held by a former rebel group in the mountainous Zintan region of the lawless country in which two governments are fighting for control. The group refuses to hand him over. The legal representative of the defendants, including former intelligence chief Abdullah al-Senussi and ex-prime minister Baghdadi al-Mahmoudi said there would be an appeal. Lawyer Hussien al-Sherif described the court’s judgement as ‘very harsh’. 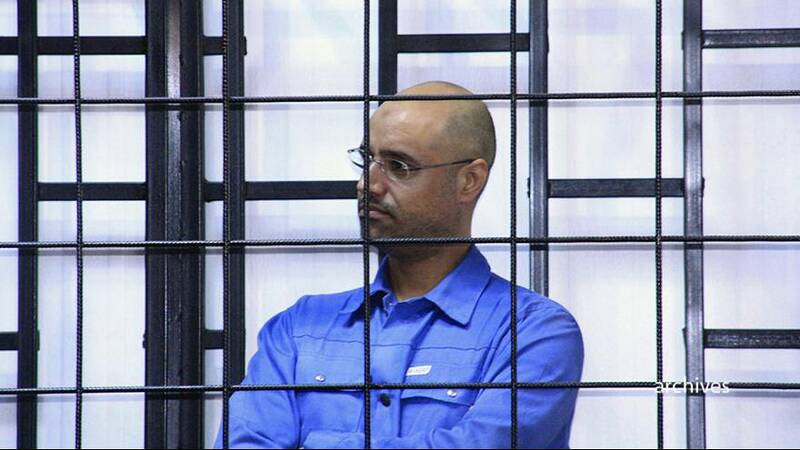 A total of 37 people were on trial including Saif al-Islam, sentenced over war crimes including the killing of protesters during the 2011 revolution that ended his father’s rule. Eight other ex-officials received life sentences and seven were given jail terms of 12 years each. Four defendants were acquitted and others got shorter jail terms. Legal experts and rights advocates said the proceedings were tainted and politicised from the start. New York-based Human Rights Watch said defence lawyers lacked full and timely access to case files and several had been unable to meet clients in private while two quit after receiving threats. The UN human rights office also spoke out after the sentences. “We had closely monitored the detention and trial and found that international fair trial standards had failed to be met,” it said in a statement, citing a failure to establish individual criminal responsibility, lack of access to lawyers, claims of ill-treatment, and trials conducted in absentia. And there was condemnation from Amnesty International. Muammar Gaddafi himself was killed by rebels who captured him after months on the run.